All new players on Poker770 receive a freeroll for a guaranteed seat at the "Happy $7,770" tournament held weekly, as well as $7.70 in Poker cash + $10 in Casino cash, just to say "Welcome" - no deposit necessary. There is also a 100% signup bonus for the first deposit up to a total of £450. Thereafter, the freerolls keep coming week after week, for the Pole Position bounty hunt, World Series of Poker satellites giving away tickets/travel packages worth some $36,000, the Ace Live €6,000 tournament, and many, many more. Licensed in the Netherlands Antilles, Poker770 is a web site operated by Cyprus-based Chicoutimi Management Ltd. and owned by Coaldale Enterprises Limited. The poker room is affiliated with Casino770, VIP Casino770, Live 770, and Arcade 770. Its downloadable application is powered by Playtech technology and belongs to the developer’s French iPoker Network. Although Poker770’s primary language is French, versions are available in German, Spanish, Italian, and Chinese as well as English. The three most popular poker games can be played at Poker770: Texas Hold’em, Omaha, and Omaha Hi-Lo. There are options for 5-Card Stud and 7-Card Stud, too. Players have a choice of Sit & Go or multi-table tournaments, as well as Ring (cash) games. Tables are divided by size of the blinds and the betting limits, with both pot limit and no limit games available. Part of the novelty of Poker770 is the ability not only to play in poker games online, but also to watch them. Non-players can simply observe by using the web site’s "Spectator Mode". It can be accessed by choosing a round or tournament from the list of available games in progress, choosing the option called "Join the tournament", and then selecting "Watch the table" mode. This is an excellent and totally risk-free way for those new to poker to become involved, learning through others actions. 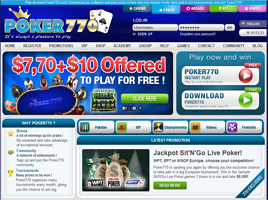 Poker770 also offers a broad array of tools to help make the experience of playing poker fun. Among these are a toggle for full-screen mode, access to players’ profiles, a friends list to show who is online, and a "games history" in real time. The latter graphically displays bet rounds, wins, losses, and other data for easy analysis. A uniquely transparent financial history is also available in real time, showing the details of all player transactions, including deposits, withdrawals, and bonuses available. To join a table and play is as simple as selecting a game from the menu of choices listed in the Lobby. To register for a seat in as tournament, tournament chips are used to pay the admission fee. Seats are assigned at random. Players seeking additional practice or poker instruction prior to playing for real money may wish to take advantage of Poker770’s proprietary poker school known as "Pokster". It is offered as a downloadable application directly from the main web site at no charge. Special coaching sessions from pros is available, too, while playing in complimentary freeroll practice tournaments organised through the Lobby. Club Poker770 is the web site’s basic loyalty program, and the VIP Club at Poker770 offers rewards worth up to $10,000 through a tiered loyalty scheme. Any player who has been enrolled for 45 days is automatically accorded basic membership. Points are earned for play and eligible for special bonuses like Boost and Extra Boost to increase the total. There is an online store that can be accessed to redeem points for gifts, too, such as poker accessories, apparel, high-tech gadgets, tokens for free tournament entry, and bonus cash. Other bonuses available at Poker770 as part of ongoing promotions include a Best Hand Bonus and a Bad Beat Bonus. There is also a Refer-a-Friend Bonus worth up to £75 per referral.